When the Rev. Dr. Michael Bell arrived at St. John AME Zion Church in Wilson, North Carolina, in 2004, he saw the blight surrounding his historic church and walked around the area seven times. The 23 dilapidated shotgun and saddlebag houses needed something beyond local government help, he knew. “I didn’t go to the city. I didn’t go to the county. I went straight to the Lord,” he said, recalling those days. He was reading from a playbook thousands of years old. Like the leader Joshua in the Bible, Bell claimed the historically African-American neighborhood of East Wilson. It was his Jericho. The 56-year-old preacher from Jamaica started small; he focused on helping the people of the neighborhood, first by hosting summer camps for children and later by converting the church parsonage into a shelter for 16 homeless men. 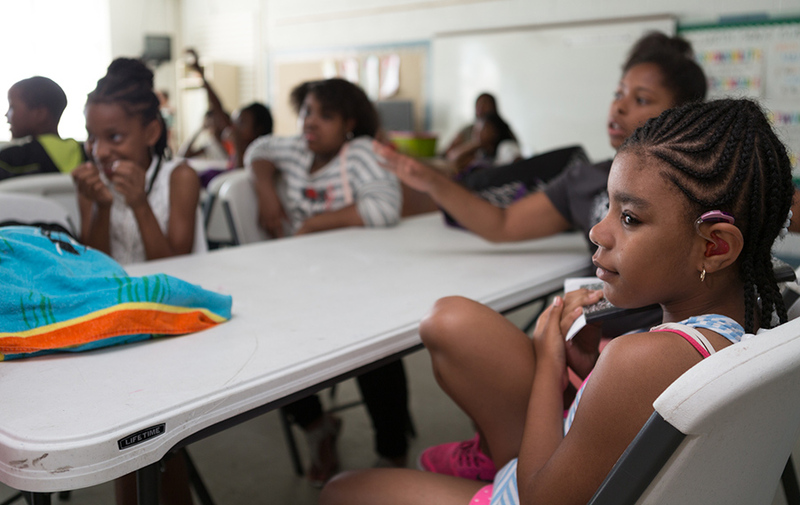 Fourth grader Shiriena Dickerson (in foreground) attends the Save A Youth summer camp, one of the first community projects that Bell initiated when he came to Wilson. Leveraging the capacity of the church’s nonprofit, the St. John Community Development Corporation, Bell continued working to revitalize two and a half blocks of downtown Wilson by buying deteriorating buildings, renovating them and acting as landlord of the small businesses housed there. Do you share Rev. Bell’s enthusiasm for microenterprises? Do you consider this the work of the church? Bell and the nonprofit are passionate about their mission to help at-risk youth and revitalize a section of Wilson left in despair by a changing economy. “We’re going to help hurting families find hope,” Bell said. In the 12 years since he arrived in this town of 50,000 people, Bell has taken on many roles. In addition to serving as the executive director of the St. John CDC, he is a member of the Wilson City Council. He served as pastor of St. John AME Zion Church when he first arrived, but now is the presiding elder of the Wilson District of the AME Zion church. He’s also a businessman; he’s the owner of SaYum, an ice cream parlor and Jamaican café in one of the renovated buildings. “He’s been a mover and shaker,” said Annie Ward, the vice-chair of the St. John CDC board and deputy director of the Wilson County Department of Social Services. Those who have worked with Bell say his energy seems endless -- one described him as a “force of nature.” He’s a gifted negotiator, a sharp businessman and an energetic visionary. And, in between the demands of his many jobs, he sometimes entertains the youth by playing a Bob Marley tune on a guitar in the music room at the Save A Youth Center, a former school that now houses the organization’s youth programs. Lu-Ann Monson, the preservation planner and historian for the city of Wilson, said Bell and other church leaders in East Wilson “have been the anchor to the community,” where the surviving enterprises were reduced to barbershops and churches. The Wilson Renaissance Complex is across the street from Amtrak and the bus station; businesses there take advantage of foot traffic. Bell looks around the Renaissance Complex's second floor, which is undergoing renovation and will be turned into affordable apartments. Pharmacist Ijeoma Uwakewe stands behind the counter at her business, Wilson Value Drug Store. The lunch crowd at Bell's business, the SaYum Jamaican Food restaurant in downtown Wilson. Staff and volunteers work at the Save A Youth building. Fifth grader Jah'cure Speight is participating in the Save A Youth summer camp. The program has served more than 3,500 children in various ways, including camps, afterschool care and tutoring. Annie Ward, the vice chairman of the board of directors for St. John CDC, shows the area where dilapidated houses once stood in East Wilson. East Wilson and the downtown area near the railroad tracks was once a predominately African-American, working-class enclave. Black men working in the tobacco industry lived with their families in the small houses owned by their employers. From 1919 to the 1970s, Wilson was the world’s largest brightleaf tobacco market, Monson said. But as the tobacco industry dried up and the local economy shifted to higher-skilled manufacturing jobs, some workers were left behind. The community lost its luster as landlords abandoned their properties or let them fall into disrepair. St. John AME Zion, a congregation founded in 1868 and located in a historic red-brick building, created the St. John CDC in 1998 to provide social and educational services as well as economic and workforce development. In 2005, St. John CDC established the Save A Youth program, which provides after-school care and summer camp for youth in grades K-8. It has served more than 3,500 children. Are there existing structures within your organization that are dormant? Could they be revived and used to further its mission? Then it launched the downtown revitalization project, which was designed to provide funding for the youth programs as well as jobs and community development. The new vision involved purchasing the turn-of-the-century Terminal Drug Store property, which sits on seven parcels in the 400 block of East Nash Street. It’s now called the Wilson Renaissance Complex and houses Bell’s SaYum Jamaican Food, Wilson Value Drug Store and Braswell’s Flower Shop. The nonprofit is also working on converting the top of the building into affordable apartment lofts and adding a laundromat and a small grocery store. Bell says that “with skillful negotiation,” the building was purchased for $60,000; the owners initially asked for $185,000. St. John CDC pulled from many places to pay for the project. It borrowed funds from a bank and also secured a $56,000 grant from the N.C. Rural Economic Development Center for job creation. This was in addition to $50,000 from the city of Wilson for predevelopment and a feasibility study and $25,000 in county funding for engineering and architectural design. People in the community also donated their time, helping to clean the boarded-up building. Located across the street from the Amtrak and city bus stations, the Renaissance Complex businesses now get foot traffic from travelers and residents, who provide a steady stream of customers for the SaYum, a cavernous eatery offering an eclectic menu. Many travelers grab a quick sandwich between stops and use the free Wi-Fi while waiting on the next train or bus. Meanwhile, locals are drawn by the affordable lunch special and the hand-scooped ice cream. Bell employs seven people at SaYum, including some “who’ve had issues with keeping a job,” he said. Sheronda Jones, 23, enjoys her work at SaYum. A graduate of the Save A Youth program, Jones has known Bell for almost a decade. During her middle school and high school years, she attended the organization’s after-school program, where she got tutoring and help with end-of-grade tests. “He was like a dad to me growing up,” she said. “He would sit me down and talk to me.” Eventually, Jones started working in the church office and then with children at the Save A Youth Center. Bell recalls that Jones was once shy and withdrawn, but through the youth program and job-readiness courses, she’s blossomed into his senior employee at SaYum. The restaurant exposes her to a world beyond Wilson. “I like meeting people coming off the train going to places all over,” she said. St. John CDC is helping bring back other businesses as well. Ijeoma Uwakwe, a pharmacist, owns Wilson Value Drug Store, which offers prescription medicines, blood pressure checks, immunizations and patient counseling. “We are here to serve the people, especially the people in the downtown area,” Uwakwe said. Many downtown residents don’t have cars, so a pharmacy within walking distance is a valuable asset, she said -- and she also offers free delivery. 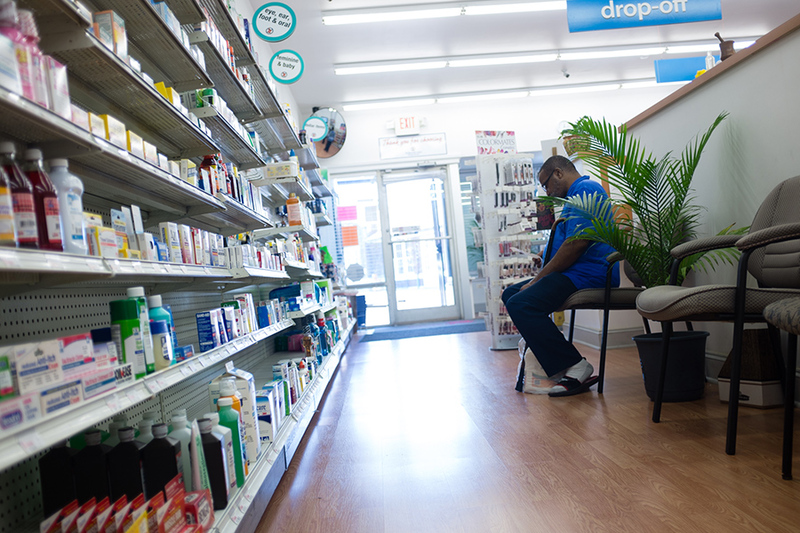 A customer waits for a prescription at Wilson Value Drug Store. The project wasn’t an instant success. For two years, the nonprofit struggled to keep the building open. At first, St. John CDC tried operating the restaurant and using the revenue to support Save A Youth. But relying on projected, fluctuating income was not sustainable, and the organization shifted to a model based on renting the buildings and using the steady rental income -- now about $31,000 annually -- instead of trying to operate a business, Bell said. Wilson City Manager Grant Goings notes that fundraising for community projects can be easier in the early years when a project is new, but sustainability is difficult over the long haul. Goings said he is impressed that St. John CDC has been able to keep moving forward with revitalizing downtown and offering the community services with a more sustainable model. The Rev. 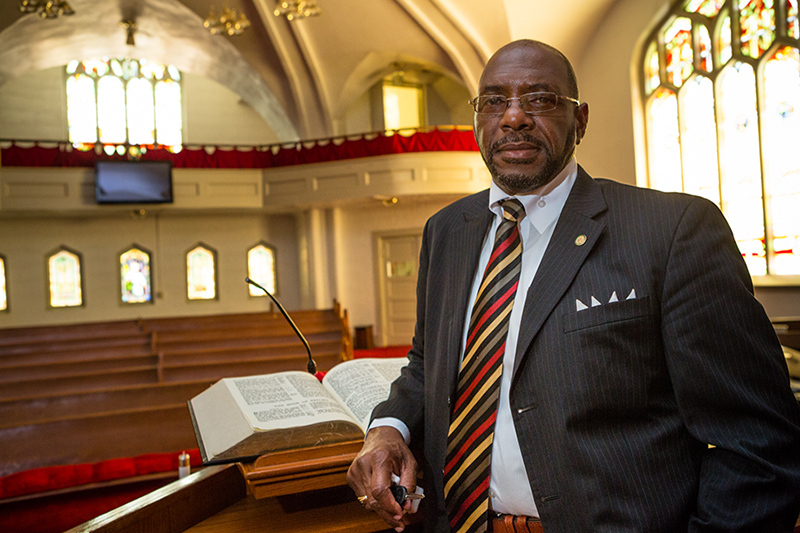 Dr. Michael Bell stands in the sanctuary of St. John AME Zion, a historic church in downtown Wilson. One strategy has been to persuade property owners to sell their buildings for less than the asking price; Goings attributes that to Bell’s passion to help people and the greater community. The combination of loans, private-sector donations, government grants and church donations has proved successful. The organization also is a recipient of United Way funding, and has been awarded a $700,000 grant from the North Carolina Housing Finance Agency to assist in converting the upstairs loft of the renovated building into 16 studio apartments. St. John CDC is described as “a small CDC with a big vision.” Does your vision match or outstrip the size of your organization? Kimberly Van Dyk, the planning and community revitalization director of Wilson, has worked with St. John over the years. For Bell and the St. John CDC board, community development is just one aspect of the mission. The real success lies in helping the community’s youth through its after-school programs, summer camp, gang prevention, vocational training and other services. At the end of the 2014-15 school year, nearly 97 percent of student participants tested in the after-school program performed at or above grade level. “If he can get them in the door, he has a supporter for life,” Goings said. In June, the Save A Youth program held a graduation ceremony celebrating the academic successes of the 365 children in the program. The featured speakers were Wilson Police Chief Thomas Hopkins and state Rep. Susan Martin, a testament to the buy-in from the community. Shonnel Ramsey-Simmons was there. She said she was proud that her 5-year-old son, Joshua Simmons Jr., is reading on a second-grade level. “The program is giving them the edge,” said Ramsey-Simmons, who volunteers at the Save A Youth Center. Her older children also participate in the after-school program and the summer camp. St. John board member Ward said the graduation ceremony was a “real milestone,” and that seeing people from state officials to parents and grandparents at the event was a confirmation that their work is making a difference. “It was a real sign that they believe in what we’re doing,” she said. The St. John CDC is both strategic and opportunistic. Would that approach work for your organization? The Wilson city manager cites collaboration, tenacity, passion and the pursuit of non-traditional funding models as some of the reasons for Bell’s success. Could you develop these traits and approaches in your organization? The Save A Youth graduation brought together community leaders in a tangible show of support for St. John’s vision. Do you host events that bring together your partners? If not, would it be useful for you to do so?